This was one of those surprisingly wonderful Wednesday night dinners. I mean, I always hope that my cooking is going to turn out well, but sometimes it just seems like everything comes together particularly nicely – and when it does, it makes even a normal worknight seem like a special holiday. In our weekly browse through the grocery store meat case we found some exceptionally nice looking lamb loin chops – we buy these often for weeknight dinners when they’re available, but they’re not always worth the money. I got them seasoned before I left for work in the morning – I trimmed off the outer fat, rubbed them with kosher salt and pepper, and tossed them in a ziploc bag with olive oil, garlic and oregano. I’ve found that the preseasoning really helps the flavor of the meat, instead of just the outside crust. We had also picked up an enormous bunch of broccoli rabe at Dunbar. I may have cooked this before but I had no memory of it. I opened the first cookbook to hand, a library copy of Deborah Madison’s Vegetarian Cooking, and immediately found a recipe for broccoli rabe with garlic and red pepper. That sounded good to go with lamb, and we also had several bags of Lebanese couscous languishing in the cupboard, plaintively asking to be cooked. When we got home from work I got out the lamb to warm up, got some chicken stock out of the freezer (one of those things we are never without) and started it thawing, and set a pot of water to boil. J chopped up a handful of dried apricots and I sliced several cloves of homegrown garlic. Everything then happened pretty fast: I tossed the rabe into the boiling water for a few minutes, took it out and drained it. I sauteed the couscous in butter and olive oil, dumped the hot chicken broth on it, covered it and turned it low for 15 minutes. The rabe was sauteed in a cast iron skillet with olive oil, sliced garlic and a good shake of hot red pepper flakes, with a sprinkle of kosher salt at the end. Then I heated up the other big cast iron pan good and hot, tossed the lamb chops into it, seared them on each side, turned the heat down slightly and let them finish cooking, which only took a couple minutes more. Once the couscous was plumped up I threw the chopped apricots in with a sprinkle of ground coriander and stirred it up. Done! We dug through our dark and mostly unsorted wine cellar and came up with a bottle of Lost River Syrah that we’ve been holding onto for a while. 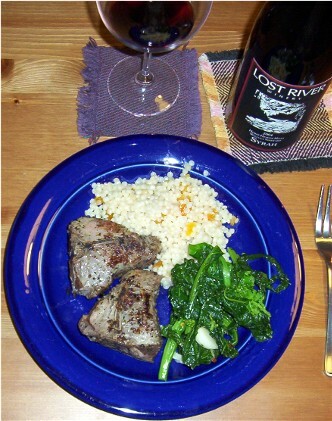 It was beautiful with the lamb, and all the flavors worked fantastically, with the salty lamb flavor contrasting against the bitter greens, then the sweetness of the couscous and apricots. I could eat this every week.